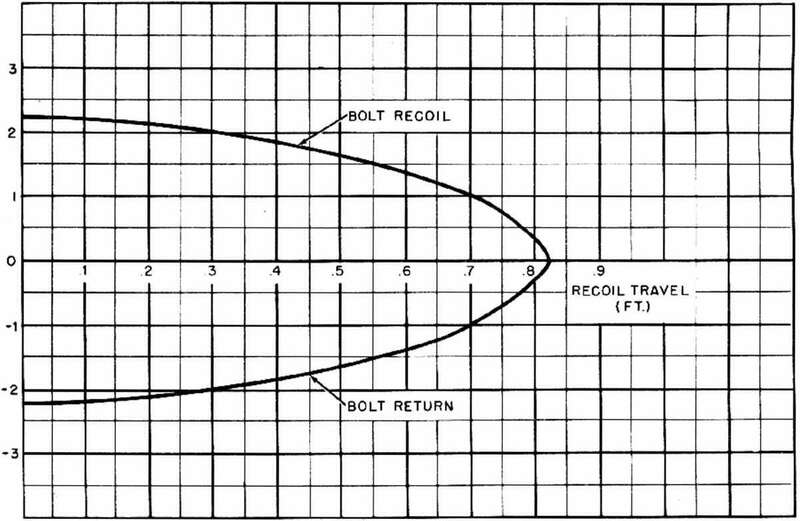 same as that of a very heavy bolt, a retarded blow-back gun would suffer from all of the disadvantages of a plain blowback gun (except for the disadvantage of excess weight). These disadvantages, which are explained in detail under "Plain blow-back system,': are principally a very low rate of fire and insufficient bolt energy for operating the gun mcchanism. Therefore, it appears that there is little point in using the retarded blowback system merely as a means of saving weight. It is important to note that effective use of retarded blowback requires a high degree of precision of mechanism and timing of operation. For safety and proper functioning, the changc in the resistance offered by the retarding device must occur at exactly the correct time during the propellant explosion. This fact makes barrel length the most critical factor to be taken into consideration. For example, it has been stated that in the Schwarzlose machine gun (which employs a toggle linkage for retardation) the barrel length is critical to an unbelievable degree. If the barrel were slightly longer, the residual pressure would be too high as the linkage rises. Since the retardation would then be too low for the existing pressure, this would create a condition of extremely violent recoil and possible explosive rupture of the cartridge case. If the barrel were slightly shorter, the residual pressure would drop excessively before the linkage has risen sufficiently. Since the retardation would then be too high for the available pressure, there would be insufficient recoil and the gun would fail to function. Figure 1-45. Relationship of Velocities in Toggle Linkage.